So a customer had flushed his iptables rules, and sadly wasn’t able to use SMTP and POP. So I put together this basic tutorial explaining how to do it! This file shows how Glance SQL database, permissions, population and images are uploaded to glance for use by openstack compute. The above is in yaml format which is really tricky so what your syntax when using it. It is VERY sensitive. After this runs we are left with a nice glance image-list output. Glance is ready for compute to use the qcow2 images we associated using the openstack Glance API. 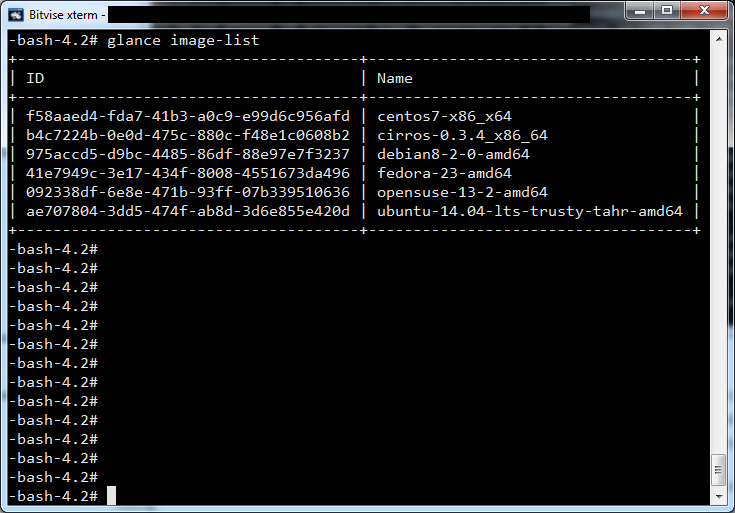 I’ve been working on some glance automation and I wanted to quickly delete all the glance images so I can test if my ansible playbook is downloading all the reference cloud qcow2 images and populating glance with them correctly. So, after succesfully exporting the image in the previous article, I wanted to download the VHD so I could use it on virtualbox at home. 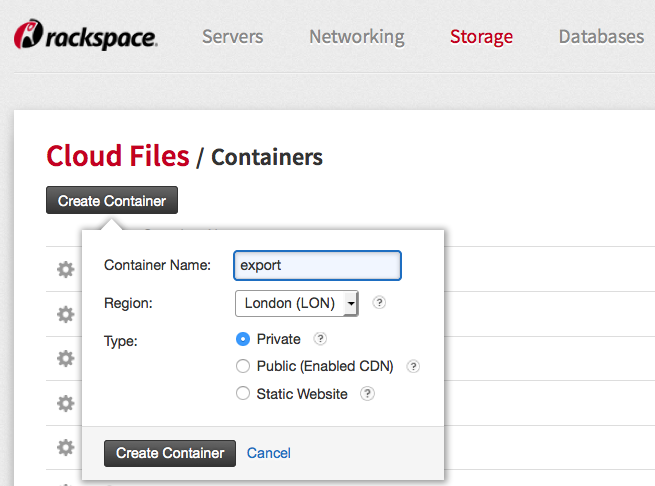 Step 1: Make container called ‘export’ in cloud files; You can do this thru the mycloud control panel by navigating to your cloud files and simply clicking create container, call it ‘export’. It’s so simple I had to check myself that it was really this simple. It is. yay! Next guide shows you how to download the image you made. 1. Put server into rescue mode. 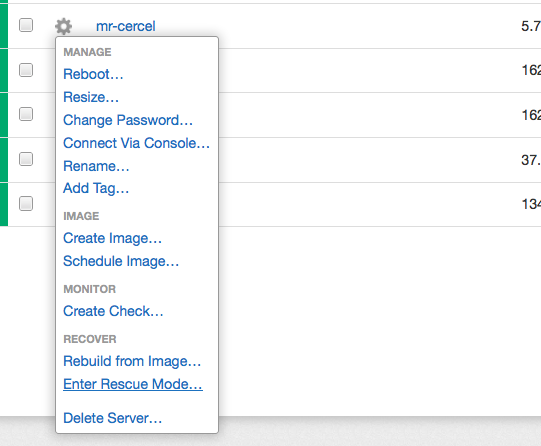 Noting the root password autogenerated for the rescue mode. 3. Mount the ‘old’ original disk (usually partition xvdb1). 7. Take the server out of rescue mode. So, if you buy a server with say a 1.6Gbps connection in this customers case, you might want to test you have the bandwidth you need, for instance to be resilient against small DOS and DDOS in the sub 500mbit -1000mbit range. [  4] WARNING: did not receive ack of last datagram after 10 tries. A big thank you to Daniel C. for this! How to speed test a Rackspace CDN? So, today, a customer was asking if we could show speed tests to CDN. So I used my french server to test external connections from outside of Rackspace. For a CDN, it’s fairly speedy! echo "Transfered $SPEED bytes/sec in $TOTALTIME seconds." echo "DNS Resolve Time was $DNSTIME seconds." Transfered 3991299 bytes/sec in 26.272 seconds. DNS Resolve Time was 0.061 seconds. Transfered 7046221 bytes/sec in 14.881 seconds. DNS Resolve Time was 0.004 seconds. Transfered 29586916 bytes/sec in 3.544 seconds. Transfered 14539272 bytes/sec in 7.212 seconds. Transfered 9060846 bytes/sec in 11.573 seconds. Transfered 25551753 bytes/sec in 4.104 seconds. Transfered 28225927 bytes/sec in 3.715 seconds. Transfered 9036412 bytes/sec in 11.604 seconds. Transfered 32328623 bytes/sec in 3.243 seconds.